Although I haven’t worked directly with Ms. Qian, I came to know her via social gathering and I am deeply inspired by her enthusiasm and devotion to her work, colleagues and compatriots. She has set a model for younger generation of Chinese UN staff to follow. On this special heartbroken moment, I would like to share the following videolink with everyone in memory of Ms. Qian, videotaped three years ago and I believe everyone will be moved by her remarkable radiating simile and graceful voices captured vividly then and forever! May her rest in the peace in the heaven!(http://v.ifeng.com/his/201010/939a7403-9a98-42cc-b502-078c74153c1f.shtml). On behalf of ICAP, we express heartfelt sorrow for untimely journey, of our beloved Ms. Haiyan Qian, for heavenly abode. No words can really express the loss we at ICAP feel but we will cherish her memories for ever as a great humanitarian. She has been not only stalwart of global good governance but also a true professional. Her extraordinary dedication to the cause of knowledge management and public service has been unparalleled. We can never forget how kind, generous and compassionate she has been to all of us. Her support of public management projects in Central America has been instrumental in progress we have been making at ICAP. We truly have lost a great friend. We are deeply sadden by the loss. ICAP. I will remember Haiyan’s smile, her positive, enthusiastic and dedicated attitude. My deepest condolence goes to Haiyan’s family. May Haiyan rest in peace. My condolences to Haiyan’s family and friends. Haiyan was the best the United Nations represents, dedicated to its ideals, always professional and a compassionate manager to her staff. We will miss her. This is tragic news. It is very sad for us as CEPA members because she has cared so much to strengthen our collaboration with DPADM. My heartfelt condolences to all of you in the Division. I am very sorry to learn the sad news of Haiyan’s passing. Kindly extend our sympathies to her family. We, the UNPOG staff, honor her memory by continuing to dedicate ourselves to the work of the DPADM/UNPOG. I also would like to join our colleagues in expressing the sadness. Condolences to Ms. Qian family. We all miss her a lot. passed away. Please convey my deepest condolence to her family. I do not know how to react to the unexpected news. 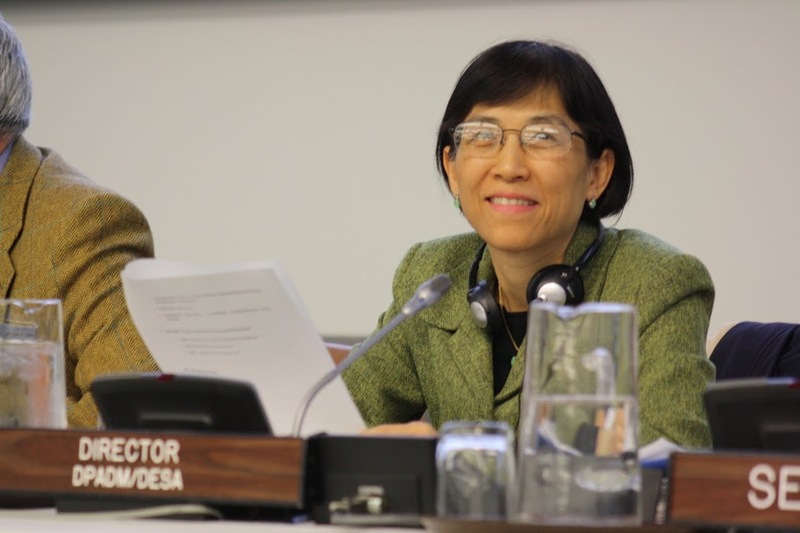 We are all indebted to Ms.Qian’s contribution to the development of public administration and public policy and, of course, to the growth of the U.N. It was my great honor to have worked once with her in CEPA. I will cherish this memory forever. We all miss her. Haiyan was one of those rare individuals that you immediately count yourself as one of the lucky ones, if you had the good fortune to meet and interact with her. On so many levels I feel deeply blessed to have met such a human being, who cared so deeply for others. Her strength, courage and dedication will remain as an inspiration to many. Her quiet encouragement, infectious commitment and her unwavering strength even in the face of personal challenges just underscore in so many ways that she is an angel that is “gone too soon”. I cherish what I have learnt from her. My deepest condolences to her family and friends, she has left a wonderful legacy and a reason to continue hope in the good within humans. Rowena Bethel (Bahamas) CEPA member. I have received with profound sadness the news about the misfortunate demise of Ms. Haiyan Qian, please accept my deepest condolences for this loss. As a VP of eGA I would like to send my sympathies to all the UNDP dedicated team and her loved ones. Ms. Haiyan Qian will always remain in our hearts and we will forever cherish our memories with her. I share the same feeling of sadness with all of you at this moment. My condolences to Haiyan’s family. As many other colleagues have already said, this is a very sad news. The relationship she had with all stakeholders group was a probe of her commitment with the Multistakeholder principles and and example of how to deal with the challenges of this diverse environment. Beyond her involvement in Internet Governance matters, she was an incredible woman. I recall many good conversations with Ms. Qian and it’s with great sadness to hear of her passing. She was a very accomplished lady and she shall be missed. With warmest thoughts and condolences to her family and loved ones. Haiyan passed away. I am so shocked! It is indeed very sad news and a great loss for all of us. It was a pleasure to meet her. She was a champion and I shall always remember her energy, dedication and passion to the work. My deep condolences to her family and to DPADM team. I have received this sad news of the passing on of Haiyan. Painful as it is we can only ask for God’s support for close family members and friends who feel her loss even more than us. She was a brave, determined, principled and charming comrade. I am so shocked by this sad news. Haiyan was so highly professional, passionate and committed, and still always gentle and patient with everybody: we will miss her enormously. My heartfelt condolences and my sincere sympathy to her family. It is still difficult for us to believe that you left and it will probably take months for us to accept the reality. You very always fair, hard-working, detail oriented and most importantly a natural loving person. I appreciated your straightness, attention to detail and generosity. I will never forget our lengthy discussions especially during my first years in the organization. I have learned a lot from you in these talks and I know you always wanted the best for the organization and for all of us. I wish patience and peace to your family and loved ones. It is not easy for them, for any of us, but at least after reading all these messages, they will realize one more time how competent you were in what you did and how much respect and love people have for you. We will make everything to realize your vision and to further strengthen the activities and projects you have started. Rest in peace! I wish to express my sincere sympathy for the family of Haiyan Qian as well as to all of her UNDESA family as well. This is a great loss for all of us. My solidarity to her family and her co-workers. Condolences on to her family and colleagues. Leave a Reply to Ziad I. Asfour, eGA, Kingdom of Bahrain Click here to cancel reply.